The Hue/Saturation control allows you to do something you can’t do with Levels or Curves, which is to directly control the hue, saturation, and brightness of an image. The HSB color model is merely an alternate slice of RGB color data. All “real” color pickers include RGB and HSB as two separate but interrelated modes that use three values to describe any given color. Thus you could arrive at the same color adjustments using Levels and Curves, but Hue/Saturation is more directly effective. To desaturate an image is essentially to bring the red, green, and blue values closer together, reducing the relative intensity of the strongest of them; a saturation control lets you do this in one step, without guessing. Often colors are balanced but too “juicy” (not a strictly technical term), and lowering the Saturation value somewhere between 5 and 20 can be a direct and effective way to pull an image adjustment together (Figure 1). It’s essential to understand the delivery medium as well, because film and even images from the web on your phone can be more tolerant and friendly to saturated images than television. Figure 1. Boosting a saturated image’s contrast can make its saturation a bit too juiced up with color (top); if you recognize this, a simple and modest pullback in overall Saturation is a quick solution. The other quick fix with Hue/Saturation is a shift to the hue of the whole image or of one of its component channels. The Channel Control menu for Hue/Saturation has red, green, and blue as well as their chromatic opposites of cyan, magenta, and yellow. In RGB color, these secondary colors work in direct opposition, so that lowering blue gamma effectively raises yellow gamma, and vice versa. When in doubt about the amount of color in a given channel, try boosting its Saturation to 100%, blowing it out—this makes the presence of tones in that range very easy to spot. The HSB model includes all six individual channels, which means that if a given channel is too bright or oversaturated, you can dial back its Brightness & Saturation levels, or you can shift Hue toward a different part of the spectrum without unduly affecting the other primary and secondary colors. This can even be an effective way to reduce green or blue spill . There are lots of ways to adjust the color levels of an image, with new ones emerging all the time, but most rely to some extent on these same basic component tools. One alternative usage of these basic color correction tools is to apply them via an adjustment layer, because you can then dial them back simply by adjusting the layer’s opacity or hold them out from specific areas of the image using masks or track matte selections. Colorists define the look of contemporary film and television. Make your way into the suite of a high-end colorist, and whether he or she is working with Lustre, Scratch, DaVinci Resolve, or even Apple Color you will find the same three or four color pots and accompanying wheeled surface controllers. This is also known as a three-way color corrector, and it has been the major missing color tool in the shipping version of After Effects until now. Synthetic Aperture’s Color Finesse version 3, now included with After Effects, fills this gap. Although Color Finesse is a full color correction application that has been included with After Effects for many years, major upgrades to the version 3 included with CS5 finally make it a toolset, for two basic reasons. First, it now has a simple interface that runs in the Effect Controls panel, which provides three-way color correction and more. Second, the full Color Finesse application now offers a full complement of features, allowing you to navigate through time and save your color work in the form of a LUT. What does all of this mean? Apply the SA Color Finesse 3 effect and twirl down the Simplified Interface. Now play with the hue offsets; for a typical modern color look, try dragging the point at the center of Shadows toward the cobalt blue 4:00 and Highlights in the opposite direction, toward the orangey 10:00. Gently nudge the midtones toward 2:00 or so for a warm look, or more like 8:00 for the Matrix (Figure 2). Figure 2. The simplified interface of Color Finesse delivers color pots to After Effects, here used to take the image in a cooler direction. Note the other controls right here in the Effect Controls—Curves properties with identical control to the Curves effect, but a friendlier multichannel interface, as well as HSL and RGB controls corresponding to Hue/Saturation and Levels, respectively. These are broken down to correspond to all four color wheels: Master, Highlights, Midtones, and Shadow effects. You could perform all of your color corrections here, without opening the full Color Finesse interface, but when you do open it, you’ll find more ways to take complete control of the color look (Figure 3). In the lower left are slider controls for all four color modes: HSL, RGB, its opposites CMY and the YCbCr controls of analog video, along with full Curves and Levels controls (with histogram), a Levels alternate called Luma Range, and a Secondary control for particular colors you might want to isolate and change. Figure 3. 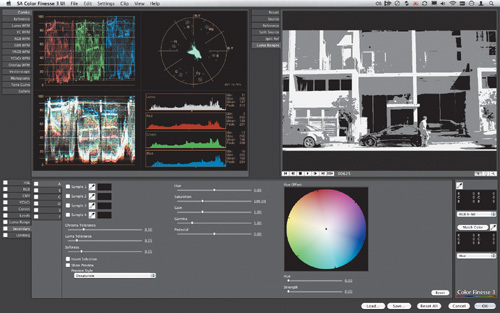 Color Finesse brings scopes into—or at least makes them available to—After Effects CS5. 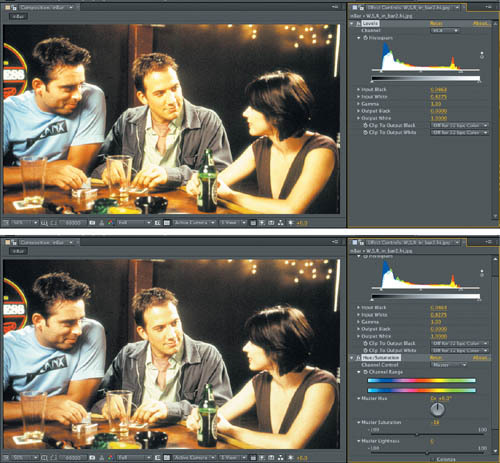 The top half of Color Finesse contains most of the professional modes of viewing and analyzing a digital video image for color. Parade, vectorscope, histogram, and tone curve slices of the image as well as a split view, a reference image toggle, and a luma range view to look only for areas that might be blown out or crushed. Finally, note that under the File menu of Color Finesse, you can choose Export and t format, and the application will create a file containing a 3D color lookup table that can be saved for use in After Effects or used in most of the world’s leading compositing and color correction applications, including those you see on the list: Autodesk Lustre and Smoke, LUTher, Scratch, and Truelight Cube, among others. Red Giant Software was first to deliver three-way color correction to After Effects in the form of its Magic Bullet Colorista plug-in, which it followed with the more fully featured and unique Magic Bullet Looks, which has now been followed by the deluxe Colorista II. These are worth mentioning not only because they’re ubiquitous, but because Looks in particular works according to a unique UI metaphor. It offers tools that correspond to all five points from source to image: the subject, any matte box filters, the lens, the recording medium, and postproduction effects. It can be fun to concoct your own recipe from these modular ingredients, or to rely on one of the presets that comes with the application or can be purchased as add-on packages from Red Giant.